Tenzan, Hakone, a photo by bloompy on Flickr. Once upon a time I had a student, an award-winning surfer from Hawaii, who with his girlfriend went to Japan during one winter. 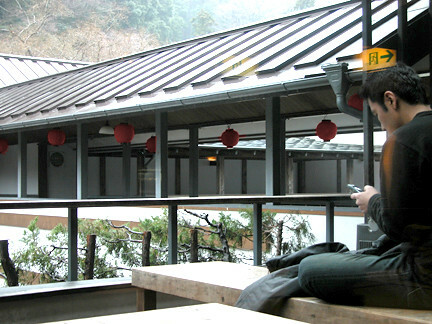 He related a story to me when they went up to Hakone, sitting in an outdoor hot springs, enjoying the hot mineral soak when suddenly the snow started to fall down. He thought it was the most beautiful thing he had ever encountered. As he lived most of his life in the ever-sunny Hawaii and then spent four years in the mild-weathered California, he never chanced upon a real winter with snow. He was truly mesmerized by the sight of falling snow.